This week I’m back in Cambridge University, attending a cosmology conference at DAMTP, the famous Department of Applied Mathematics and Theoretical Physics. I’m delighted to be back – Cambridge is only a short hop from Dublin and it is such a great place to visit, with its beautiful colleges, bijou shops and lively student life. I arrived late in the afternoon, and walked to the town centre in a light rain; tourists everywhere were complaining about the English weather but I thought the rain and the falling light set the scene perfectly as I walked along past the ancient colleges. 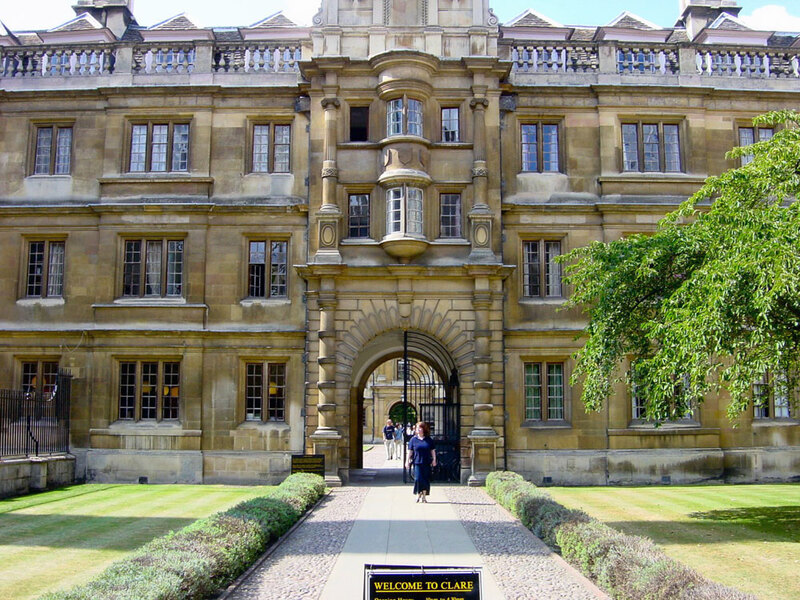 This time around I’m staying in Clare College, one of the oldest colleges in the university. Its beautiful front quad is just off Kings’ parade to the front, while the back of the college straddles the River Cam all the way back to the University Library. The rooms are lovely (no tv – wouldn’t have it otherwise). In fact, working at my little desk and watching the rain across the quad makes me feel quite nostalgic, like a student again – perhaps in another universe there is a younger me starting out in this fabulous university . The conference, Infinities and Cosmology, is not on theoretical or experimental cosmology, but on the philosophy of cosmology. It forms part of a new Oxford-Cambridge initiative aimed at bringing physicists and philosophers together in order to improve our understanding of the universe and its origins, from exploring the meaning of the initial singularity to the philosophical implications of theories such as cosmic inflation and the multiverse. This particular conference was organised by John Barrow , Jeremy Butterfield and David Sloan, names that carry a lot of weight in the intersection of physics and philosophy, and visiting speakers include other heavy hitters such as Anthony Aguirre, Mihalis Dafermos, George Ellis and Simon Saunders. You can see the conference program here. 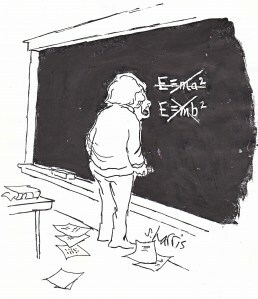 That said, mixing philosophy with physics is not an approach that meets with universal approval – Stephen Hawking once declared that ‘philosophy is dead’, while Laurence Krauss has also been pretty scathing about the contribution of philosophers to physics. Both are physicists I hugely respect, but I think this initiative is more about making physicists aware of their deepest assumptions than about converting philosophers into cosmologists. Also, those of us with an interest in the history of cosmology notice that scientific progress has often been hindered by unexamined philosophies – from Aristotle’s geocentric model of the solar system to Harlow Shapley’s faith in a single-galaxy model, from Einstein’s assumption of a static universe to the steady-state universe of Hoyle, Bondi and Gold. More recently, I have long suspected that some of the resistance to inflationary models arises from a simple dislike of the exceedingly large numbers involved – an objection that is understandable, but not really tenable from a philosophical point of view. So I’m not expecting that philosophers will suddenly shine light on well-known problems in big bang physics – it’s more that we physicists can profit by examining the philosophical assumptions we operate under. In general, scientists are pretty good at being aware of underlying scientific assumptions, but sometimes a general philosophical viewpoint is often overlooked precisely because it is so widespread. Another advantage is that philosophy gives us a useful language in which to articulate underlying assumptions. – In a universe with a definite beginning, when did the laws of physics becomes the laws of physics? Were they somehow ‘born’ with the universe, or did they come into being at a later stage. In other words are they emergent, rather than fundamental? If so, what entity or entities did they emerge from? – Could it be that space and time themselves are not fundamental but also emergent? In other words, is it possible that space and time were not born with the universe, but are made up of something more fundamental than either? (One clue here is Einstein’s discovery that space and time are not absolute but affected by motion and by gravity). Could it be that they are non-fundamental as well as non-static? – If so, doesn’t this create problems of causality in the case of time? This is just a flavour of the sort of questions one encounters in the philosophy of cosmology. Right now, I’d better turn in so I’m wide awake for tomorrow. In the first lecture, George Ellis, one of the world’s leading theoretical cosmologists, will give a talk ‘Infinites of age and size, including issues in global topology’ . I suspect I’ll need my wits about me…. 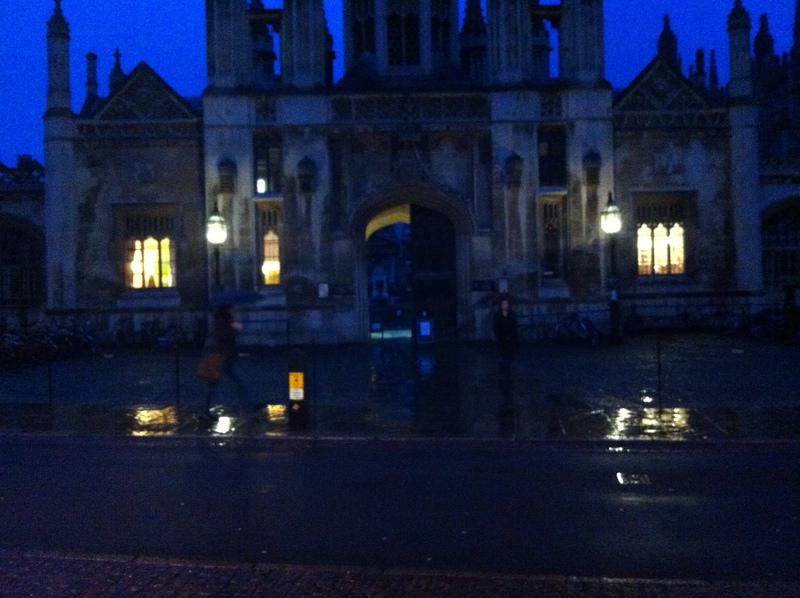 Staying at my old college, conferencing at my old departement, and you probably get to see Cambridge in the snow. Lucky sod.